This past weekend I had the privilege to travel to Atlanta to be with my husband for his work holiday party. It was good to get away, and relax. No stamping went on though! We came back to a snowstorm and cold, icy weather. Back to Colorado reality! After trying Brusho by wetting the surface first and then sprinkling the Brusho powder, I switched and sprinkled the powder and then spritzed using the Stampin' Spritzers filled with water. 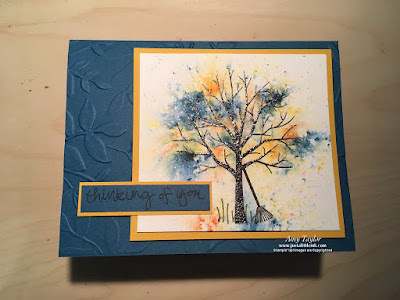 The paper I used was Watercolor Paper and the tree from Sheltering Tree was heat embossed with clear embossing powder after stamping it using Early Espresso ink. It was so much fun! I can't wait to try other colors.